Keeping your backpacking axes and bushcraft axes sharp is important for keep them effective, safe, and dependable. We’ll see how you can sharpen your axe at home by hand using tools such as oil stones, wet stones, a file, and even a rock. We’ll also look at how to sharpen an axe with machine tools such as a bench grinder, or dremel tool. 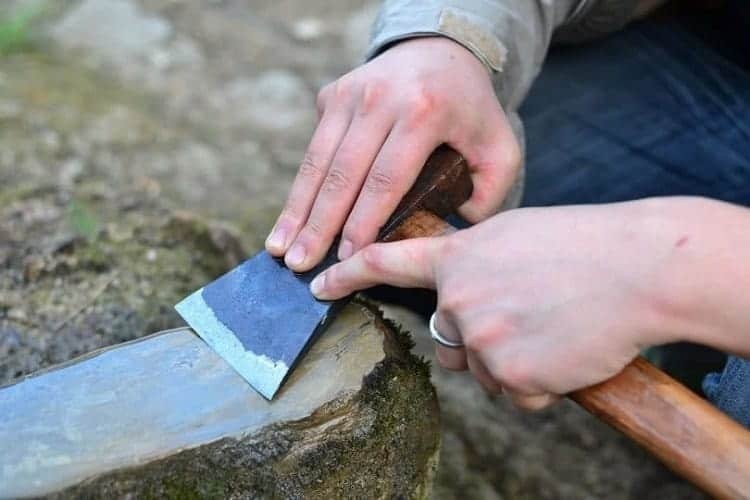 For those lacking basic tools, we’ve included a bonus section of two methods to properly sharpen an axe without tools using a rock. Safety is important when sharpening an axe. You’re working around a blade that could cut you to the bone with one wrong move. We recommend you use leather safety gloves and eye protection. 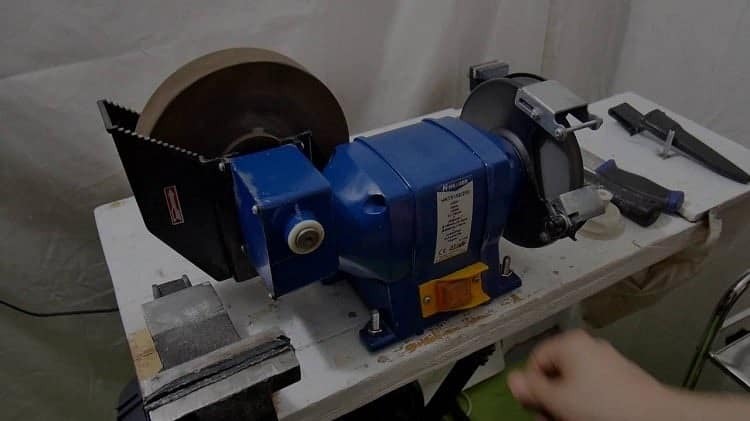 No matter which sharpening process you use, keeping your hands and eyes safe is a must. If you’re using a dremel tool or bench grinder to sharpen, use ear protection too. Cleaning the axe head first removes any dirt or rust that makes sharpening the axe harder. Secure your axe in either a bench vice, or your lap with the axe head between your legs like the picture above. Using steel wool, buff away any surface rust and dirt. As long as you get most of it cleaned off, you can move on to your preferred sharpening method. Secure the axe either in a vice or firmly in your lap. Use a sharpie and color the entire bevel to use as a guide. Take a 10-inch mill file and bring it to the blade. Match the angle of the bevel and the angle of the file. Push long, continuous strokes 5 to 10 times along the blade. Perform the equal amount of strokes on the other side of the blade. If the blade is still damaged, perform more strokes on the blade. 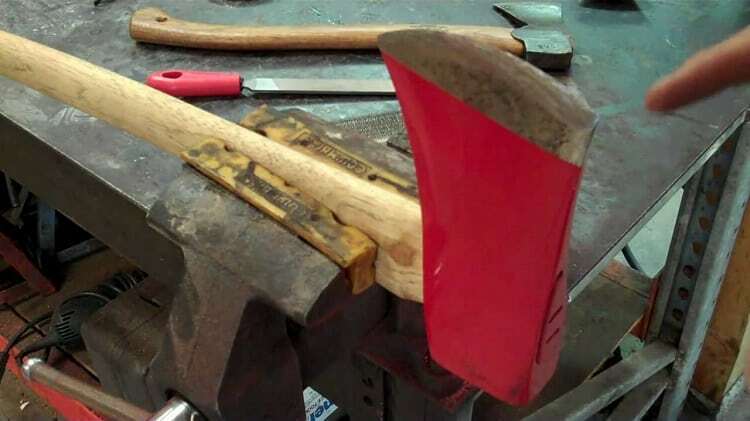 Secure your axe head with a bench vice. Sharpie the bevel edge to create a guide for filing. Hold the file with a hand on each edge, with one hand anchored at the top of the axe head. Match the bevel angle and draw the file across the edge. Repeat 10-15 times to sharpen the edge. Repeat the same process on the other side of the axe blade to finish sharpening. Apply lubricant to the coarse side of your stone. After working the axe blade with the coarse side, you can flip the stone over to the fine side and use the same process. After working the axe head on the fine sharpening stone, it should now be razor sharp. Test the sharpness on your arm hair or run your fingernail against the blade. If the edge cuts your hair or leaves a notch in your fingernail, it’s sharp and ready for service. This method works great for sharpening both axes and knives, so if you ever need to touch up a knife blade, you’ve got the skills to take care of the job. The edge of the axe blade should now be sharp enough to cut paper. We can now move to the fine side of the sharpening stone. The axe will be between your legs in the same position as before. Your axe head’s blade is now honed and razor sharp if you’ve used the correct sharpening technique. 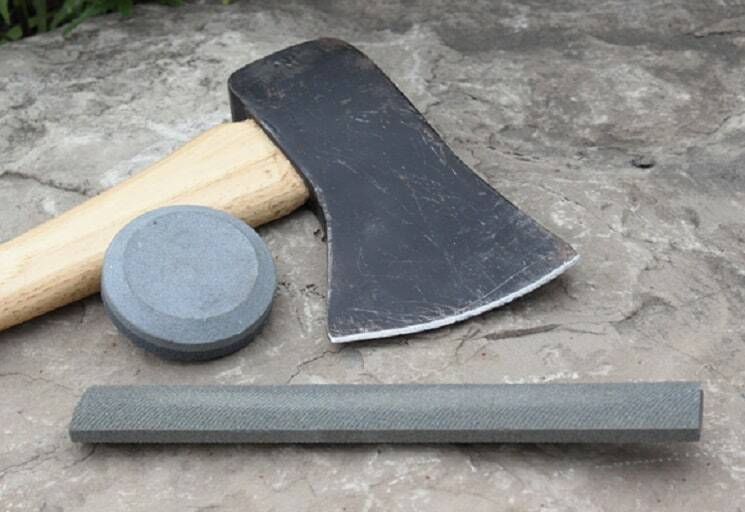 The sharpening puck’s fine grit works to refine the edge and turn your axe into an effective wood processing tool. Match the angle of the bevel to the grinding wheel. Use light pressure and grind so that the wheel moves away from the blade, not onto it. Frequently dunk the axe head into water to cool it off and preserve the temper. Grind the other side of the axe blade the same amount as the previous side, making sure to dunk the axe head frequently. Clean up the edge with a wire brush to remove the burr and give the axe a sharp edge. Bench grinders can take away lots of material quickly. After a few minutes of grinding, you can take away a lot of damage that would’ve required lots of filing by hand. A quick touch up with a mill file afterwards, and your axe will be razor sharp like new. 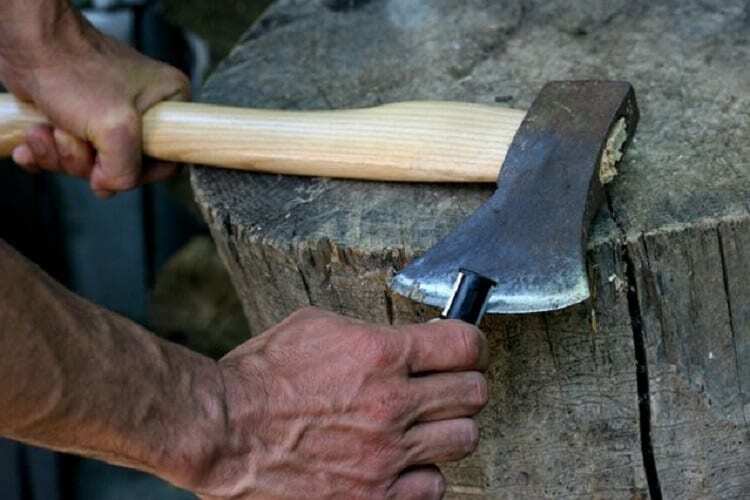 Sharpening your axe head with a grinder isn’t ideal, as the heat from grinding can ruin the temper of the axe head’s steel. Use light pressure and intermittent grinds to prevent heat buildup. Dunk the axe head in a tub of water to cool it and preserve the temper. If you’re not careful, the bench grinder can also leave your blade with a hollow grind. Be sure to limit the amount of material you take away to a minimum. Sharpie the edge of your bevel to create a guide for sharpening the blade. Match the angle of the bevel with your dremel tool. Use light pressure and grind from one edge of the blade to the other. Using a dremel tool is a great way to speed up the process. After a few minutes of careful grinding, you can have your axe razor sharp and ready for business. axe head will heat up and lose its temper. Use brief and intermittent grinds to prevent the axe head from heating too much. Dunk the axe in a tub of water frequently to keep the temper of the axe. Apply water to your rock if you wish for it to act more like a wet stone. Hold the rock firmly in your hand without exposing any fingers around the sharpening edge. Use either small circles or sweeping motions along the length of blade while counting the number used. Use the same amount of motions on the other side of the blade to sharpen it. Strop the now sharp blade against a piece of leather or pant leg to remove the burr. This first method uses a fine, smooth rock to sharpen similarly to using a sharpening puck. Stones like these are easiest found in rivers. Use small circles to sharpen the blade on the wet rock and be mindful to use the same number on the opposite side for an even edge. Any sharpening edge you’d normally use with a sharpening puck will work just the same with an improvised one. Take a piece of quartz you found and smash it between two rocks. Grind the quartz to a fine powder and remove any leftover large chunks. Take a piece of live wood with the bark removed and wet it. Add water to the quartz powder and hold it in your hand. Drag the piece of live wood through the powder to create an improvised sharpening stone. Drag your knife blade across the quartz’ed area on both sides to sharpen it. The second method comes from Bear Grylls during a survival trip in Costa Rica. Bear smashes a fine course rock and uses live wood to create a sharpening stone. This method is great for giving your camping knife or sport hatchet a quick touch up whenever you’re in a survival situation. Use an angle grinder/sandpaper to remove surface rust, being careful not to heat the head. Dunk the head in water occasionally if you use an angle grinder. Use a machine sander or sandpaper to sand the blade starting with 120 grit sandpaper and moving up to 800 grit sandpaper. Use a waxed buffing wheel in the direction of the blade or clean rag and apply wax polish. Take a clean rag and apply a fine layer of light machine oil to protect from rust. 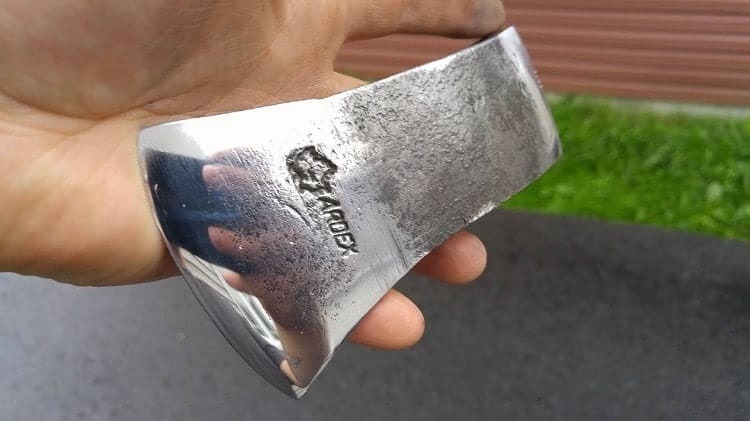 Polishing your axe head is a process that will protect all the hard work you’ve put into sharpening and honing your axe head. Polishing your axe head protects the edge to help it last longer. hurt the metal of your axe head. If you use an angle grinder, be careful to not heat the axe head up too much. Dunk the axe head periodically to keep the axe head’s temper. You’ve now got a sharp and polished axe head that’s ready for anything you decide to put it up against. While your even the most durable axe edges won’t stay sharp forever, here’s a quick list of tips to help care for your axe’s newfound edge and maintain the handle wood. 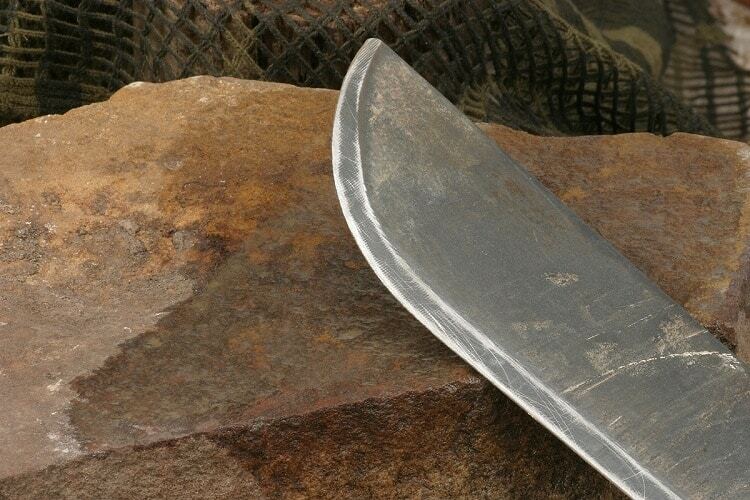 If you have any questions or comments regarding sharpening your axe, please leave your comment below.